I released my first novel, Phoenix Afterlife, on October 12, 2015. It’s available for sale in paperback and eBook formats from Amazon, Barnes & Noble, Apple iBooks, and other online retailers. 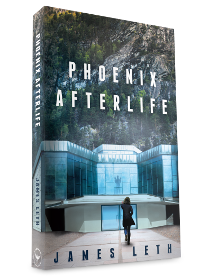 Set about 10 years in the future, Phoenix Afterlife is hard science fiction based on current theories of the brain and consciousness. It is also a love story with literary and philosophical roots. Neuroscientist Alice Kurz and her team have developed a technology that could lead to immortality. For Alice, it’s a chance to develop a cure for Alzheimer’s, the disease that destroyed her grandmother. Test subject Eliot Stearns knows nothing about this. He believes he’s part of a five-day isolation study, locked in the lab, his only contact with the rest of the world through videoconference with the research team. Eliot and Alice grow close through deep conversations exploring the world’s oldest stories, the nature of consciousness, and what it truly means to be human. But everything changes when Eliot discovers that the study is not what it seems to be, and five days of isolation could last the rest of his life. You can click the button below to add Phoenix Afterlife to your reading list on Goodreads. Please consider reviewing my book there, or on Amazon, iBooks, or Barnes & Noble.